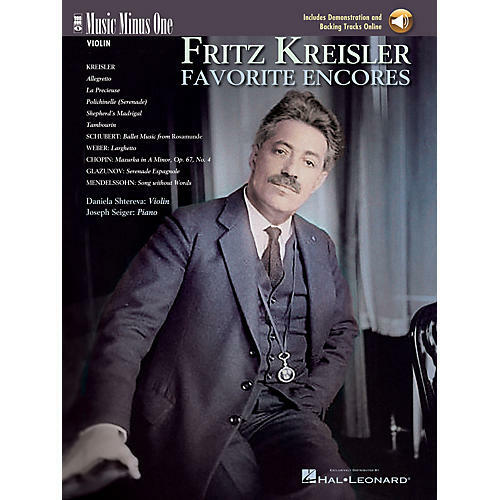 Fritz Kreisler, one of the most popular and revered violinists of the last century, was also a great transcriber and arranger of music for the violin. This collection of such transcriptions and arrangements (of Chopin, Weber, Glazunov, et. al.) and several of Kreisler's own compositions, make for great performance pieces. Highly recommended. Your accompanist is the well-known accompanist of Mischa Elman for many years, Joseph Seiger. Includes the complete solo part printed on high-quality ivory paper; and two digitally mastered compact discs containing a complete performance with soloist, then performed again minus the soloist.